Even though I knew of private gun ownership when I first came to the United States, there was still an emotional disconnect between seeing others own guns and realizing that my parents could. For people from even less RKBA friendly countries than the USSR, such as China, Koreas and Japan, that emotional disconnect may be even greater. 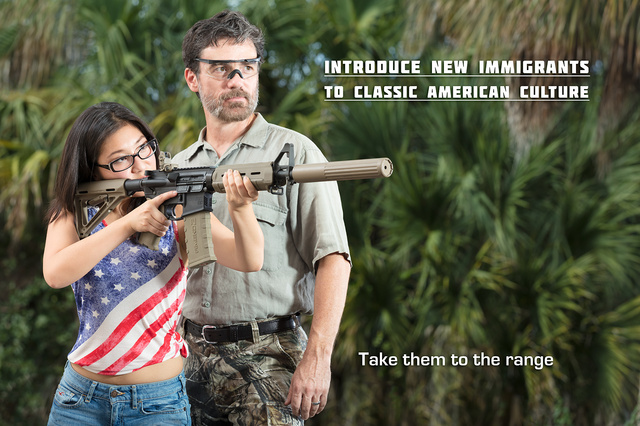 So take your new immigrant friends shooting. Teach them the safety, and the tactics, and the political history behind the Second Amendment and the preexisting human right it affirms. This entry was posted in rifle, rkba, self-defense, sound suppressor, weapon and tagged 223, AR15. Bookmark the permalink. It is not just immigrants from other countries. I was born in Washington, DC and grew up mostly in Chicago. It wasn’t till a friend here in NH introduced me to shooting as part of an introduction to hunting that I became interested. I am now and an instructor. Take people to the range and watch the interest of many bloom. Permission to share this statement in full (with attribution) on The Weapon Blog?